Today, majority of people are using Windows but what I’m going to talk about is Screen. 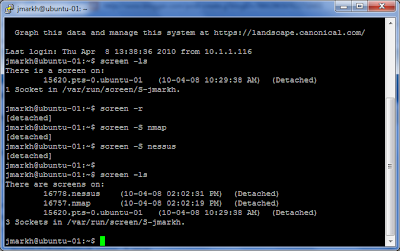 Screen is a GNU utility that allows you to use multiple windows (virtual VT100 terminals) in Unix/Linux. Although, if you have a console access, you could spawn multiple terminals, there are two features I would like to highlight. First, is the fact that screen stays active, even when SSH session is terminated. All processes initiated will keep running and could be re-attached once SSH connection is re-established. Furthermore, since screen session initiates a separate process rather than login session, it is more resource efficient. In addition, using Screen, it is possible to share processes between multiple users and/or protect using password. For example, you create a screen session and run a command. Another person would be able to list existing screen sessions (screen –ls) and attach a session to their terminal (screen –r). Of course, that is not very secure, therefore it is possible to protect the screen session using user password. C-a C-x Lock this terminal. The man pages for screen are quite readable and make a good tutorial. Posted by John Markh at 2:12 p.m.